This is a monster tire and I have been using it for my tourings. No punctures at all. These were recommended to me. Seem to do a good job when riding where there is a lot of glass chip. Excellent, tough road tyres, ideal for winter training and poor roads/lanes round Chilterns. Folding versions were well-packed, fitted onto rims by hand, and roll well. Good deal from Merlin, very happy with my choice. Awesome for commuting through the city!! This is my second set of tires. I have over 5000 miles on the first set and I've only had one flat. Great tires!!!! These are the greatest tyres for the road. Totally changes your confidence level while riding. Incredible puncture protection and still fast!!! Since the last 8 years I use only this tyre on my bike. The best against puncture! These are not installed yet; but I already have the 23 mm version on my high end road bike. The Hardshell ride is great. I did not notice any ride difference from the Gatorskin's I now have on my other road bike. I am going to put these 25's on my training wheelset for additional protection and comfort, especially for the terrible condition roads I somewhat frequently ride where my son lives. I have had no problems with Continental tires over the last 10 years. I now use them exclusively on both my road bikes. I need the "Gator" protection due to road conditions and presence of thorns. Extra protection has been paying off. If one needs road tyres with some extra road debris protection, GatorHardshell is the tyre to get. For regular road conditions, 4000SII is awesome. I haven't had time to put them through the ringer only 60 miles, so I will comment on performance. I've been riding the ironically named S-Works Turbo that I got on sale, if they were that great they wouldn't be on sale, you can feel them sucking the watts from your legs if you don't have them inflated to bouncy. Now that that's off my chest. 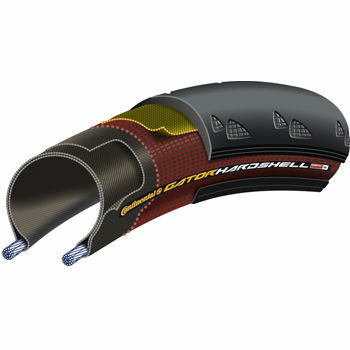 The GatorHardshell is a faster tire then the S-Works, Vittoria whatever. The ride is not quite as plush as the S-Works but it is faster. I like my tires on the higher pressure side. I used to run the GP 4000 SII, the GatorHardshell is a little slower, but not much, and if the puncture protection is as good as the other reviews say, I'm willing to take the little hit for every day reliability. So if you commute, (most bosses don't understand a bike flat), or take off for a ride when there's a slim chance of daylight when you return, this is your tire. GatorHardshell's won't kill your speed, and if you find yourself returning home on an unlit winding road, racing monsters in the twisted paths of the primitive tracks of your mind, it's nice to not worry so much about that pitch black country road flat. Great tire. I purchased this because my friend has over 2000 miles on this tire and rarely flats. This is my 3rd pair of Conti Gators now... I have always gone back because of their unsurpassed flat protection and durability. I have tried other kinds of tires but none have yet surpassed the Continental GatorHardshell! This is the second set of these I purchased and had good luck with he first pair. They lasted about 800 miles which is good for the way I ride. Great tires. Excellent puncture resistance. Be careful on wet roads with these though. I am Masters Bike Racer on the roads, have raced roads for more than 33 years, bike racing and triathlon, riding 10 to 15K miles annually. This tire has been the best puncture resistant top performing tire I have used. After 6 months I am just waiting for the wear hole notches to close over or see threads coming through the tread. I do road race with these on rough road courses. I use the GP 4000S for closed crit courses due to grip and weight. The Gatorhardshell tires are on all three of my road racers and am very hesitant to change. Nope, won't change. They are too good. Happy Riding without flats. Over twenty years of riding I've only run Continentals ... this is the best one yet. I average about 6K miles a set.